Saskia has a very keen interest in seabird ecology in general and currently pursues a 2 year MRes at University College Cork. She is particularly interested in how the geographic location of colonies and resulting differences in environmental conditions affect the foraging behaviour and labour allocation of breeding pairs. She has worked and volunteered for several ornithological and marine research institutions during which she developed her passion for birds and the marine environment. Examples are the Avian Research Institute “Vogelwarte Helgoland” (DE), the Alfred Wegener Institute for Marine and Polar Research (DE) and the Vancouver Avian Research Centre (CA). 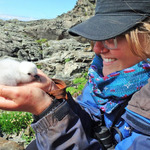 After graduating from the University of Aberdeen in Marine Biology in 2013 and before starting her current Masters she also worked as a research and field assistant in Dr. Christian Rutz’s group at the University of St. Andrews, which focuses on tool-use behaviour in New Caledonian crows. Well done for meeting the target. I really hope you can secure the bonus on top! The project has the potential to be a milestone for seabird conservation and that almost instantly! Finger's crossed!